South Sulawesi Province provides many interesting attractions to tourists. Most of the time, travelers are attracted to the unique burial ceremony in Tana Toraja. One of the best locations to witness both traditional procession and burial site is Lo’ko Mata. 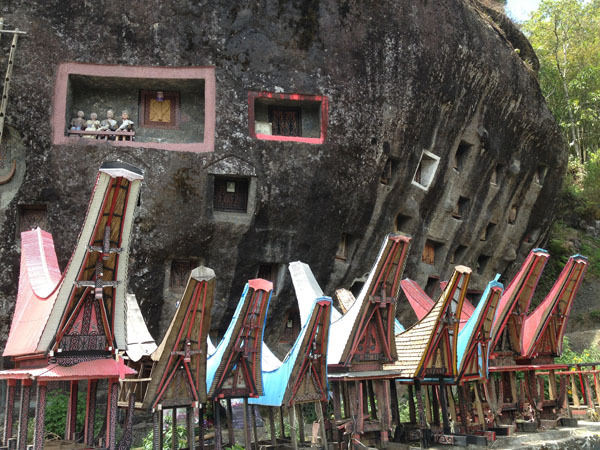 It is a popular settlement located in Tana Toraja, after all. Most of the time, tourists visit such place to see the wall of the death. There are several holes in a great rock nearby. Each of them displays sculptures, which represent the death people buried inside. Despite the creepy aura, they are considered interesting. Lo’ko Mata Wall is the most popular tourist lure in such region. The wall consists of numerous holes. The locals use them to bury their dead relatives. The higher the position of the hole is the better the social status of the family. Below the wall, there are small Tongkonan. These represent the local culture of Tana Toraja. Not to mention these features become a good object for photography. It is possible to explore the location, but it requires the permission from the keeper. Make sure to talk to the villagers first! Once you get to Lo’ko Mata, you may see a wide farm. It features beautiful nature scenery, too. The rice fields look peaceful and abundant. During the harvest time, you can see some farmers working on their farms. In order to reach the wall, you need to walk for 45 minutes. It is because the location is separated from the village. This won’t be a trouble for adventurers, for sure. In this case, bottled water and some snacks should have been prepared beforehand. The size of the wall is enormous. It consists of several big rocks, as well. The locals use them to bury their relatives. The rocks came from the nearby mountains, actually. According to the locals, there are some stone burial sites near to the farms. This is something new, as you won’t find it somewhere else. Among these attractions, the most interesting one is the carved burial cave. These are holes on the wall. Each of them contains corpses and the position is different from one to each other. The locals usually take about 3 months to build such hole. In front of the wall, they place Duba-duba. These are small Tongkonan. In the midst of such structure, there is a coffin. For tourists, it takes some money to explore this location. Hopefully, the money will be useful for the villagers. This way, they can improve the services and maintain environment well. Your primary destination is Tana Toraja Regency. From Makassar City, you need to spend approximately 7 hours and 30 minutes. It is because the distance is 315 km. For those who come from other provinces, the best type of transportation is an airplane. In this case, you need to reach Sultan Hasanuddin International Airport. Once you get there, continue your journey to Tana Toraja and visit Lo’ko Mata Wall.